Clear Blue’s Smart Off-Grid Solar Controller is a powerful, full-featured controller that enables manufacturers to deliver reliable, intelligent, and high performance off-grid options to their customers. It has been designed to be easily integrated into a variety of products such as solar powered streetlights, telecom systems, security systems, mobile power, lighting and signage, electronic charging stations and more. All systems with the Smart Off-Grid controller are remotely managed, controlled and monitored by our Illumience cloud. Clear Blue can also provide full power packs with our controller, including solar panels, batteries, and all related components. For hybrid wind/solar systems, the controller works with the Clear Blue Wind Controller. 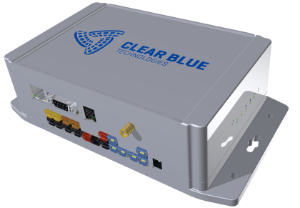 For large load applications which cannot be powered by solar energy alone, the Clear Blue Solar Controller with Grid Connect is the perfect solution. Grid Connect controls the amount of power that is pulled from the electric grid to ensure that grid power is only drawn when needed, and that maximum solar energy is first obtained. Supports 3 power inputs, each with independent control. Supports both D/C or A/C lighting loads as well as other low power devices, with dimming and optional motion detection. Uses our patented dynamic charging technology, which calculates battery age and quality, and adjusts the battery charging as needed to extend battery life. This capability can add 1-3 years or more of battery life compared to other controllers. Supports a variety of battery technologies including AGM or Gel batteries as well as other up and coming energy storage technologies. The controller measures and transmits all key operating parameters to the Illumience Cloud Control service, and allows all key control settings to be changed remotely. This enables remote control of all power and load functions to optimize performance, set lighting profiles and dim lights as needed. The system also automatically identifies and diagnoses issues for fast and convenient troubleshooting, sending you alarms when needed. Built in to the system is a machine-to-machine (M2M) wireless communications service that transmits this data every 5 minutes or less, depending on the customer's requirements. The controller also comes with a temperature probe, antenna and communications cable harness, power cable harnesses and an optional motion detector.